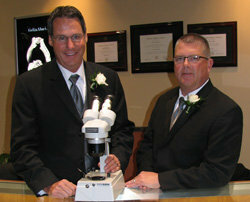 Co-owners Ken Russell and Collin Ballard, have over 60 years combined experience in the jewelry industry. Both Ken and Collin commit themselves to staying up to date on current industry trends, by attending at least two jewelry trade shows annually. In addition, Ken and Collin annually attend the five day American Gemological Society Conclave where they receive continuing education along with networking opportunities to exchange ideas with other jewelry professionals. Ken and Collin are both enrolled in the American Gemological Society’s Gemologist Program. In 1998, Ken graduated from the Gemological Institute of America (GIA) with a focus on appraisals. Collin holds a GIA diamond certificate. Outside of the store, Ken spends time with his family and at his cottage, and Collin enjoys cooking, hunting, traveling, entertaining and spending time with his family. 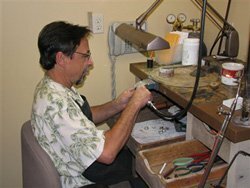 Dave is our Master Goldsmith and viewed as one of the leading Goldsmith in West Michigan. He is a Grand Rapids native and served his apprenticeship under a top goldsmith in Tucson, Arizona. Dave has over 30 years experience and has been working with Russell & Ballard for over 15 years. He is highly skilled in diamond settings and custom design. Russell & Ballard has an outstanding support staff here to answer any of your jewelry questions or to help you pick out a gift for that special someone. Upon hiring, Russell & Ballard thoroughly train and educate their staff. Ken personally trains his staff on diamonds. Each staff member reads through Diamond and Gemological Institute of America manuals and are then quizzed on their understanding of the material. Our support staff includes: Jaimee and Michelle.